Gross domestic product, the broadest measure of goods and services produced across the economy, contracted at a seasonally adjusted annual rate of 2.9% in the first three months of the year, according to the Commerce Department‘s third reading released Wednesday. That was the fastest rate of decline since the first quarter of 2009, when output fell 5.4%, and matches the average pace of declines during the recession. 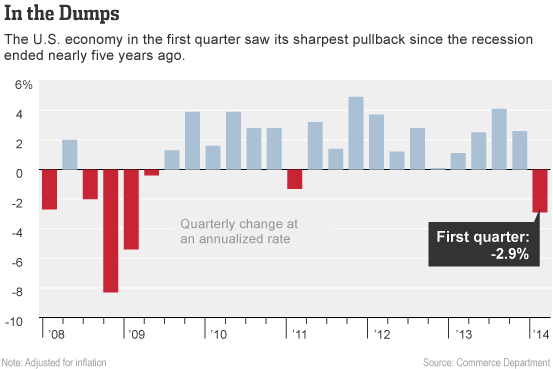 “GDP was recession-like in the first quarter, although most other data clearly signal that the decline is an outlier,” said Jim O’ Sullivan, economist at High Frequency Economics. In its third GDP reading, based on newly available data, Commerce said first-quarter consumer spending and exports were even weaker than previously estimated. Consumer spending growth was lowered to 1% from 3.1% previously, largely because health-care spending was weaker than previously estimated. President Obama has been in office since 2009. His economic policies have been in place for more than five years. It is becoming obvious that those policies have not been effective in reviving the American economy. It is time to send people to Washington who have new ideas that will encourage small business growth and turn the American economy around. This entry was posted in Uncategorized and tagged Barack Obama, Consumer spending, Economy of the United States, Gross domestic product, High Frequency Economics, Recession, United States Department of Commerce, Wall Street Journal by granny g. Bookmark the permalink.